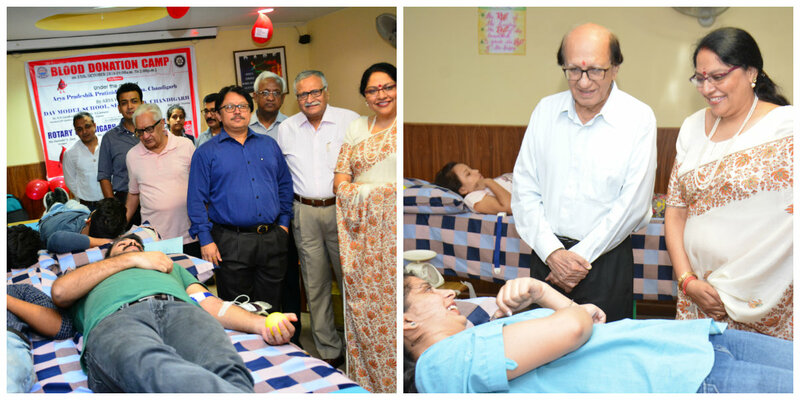 As an earnest endeavour to serve humanity and illuminate the life in peril, DAV-15 Chandigarh organised a Blood Donation Camp on Oct 15, 2016 from 9:00 to 2:00 p.m. in the school premises. The camp was undertaken under the aegis of Arya Pradeshik Pratinidhi Upsabha, Chandigarh with the joint collaboration of Rotary Club, City Beautiful. Hon’ble Principal Mrs. Anuja Sharma and her team had been working fervently to make this mega event a success. As a motivating leader, she ignited the spirit among her staff and students to put in their whole-hearted endeavours for this humanitarian task. Many NSS Volunteers, Alumni members, Rotarians, General public from the vicinity of sector-15, Staff Members, Students and their parents joined hands together to support this noble cause. A team of doctors from GMCH, Sector-32, Chandigarh conducted the camp and ensured the safety of donors. Honourable Rotarian Sh. T.K. Ruby from Rotary Club, City Beautiful, Chief guest of the event graced the occasion with his benign presence. Various dignitaries –Sh. R.C. Jeewan (Chairman), Sh. H.R. Gandhar (President, APP Upsabha, Chandigarh), Mrs. Madhu Bahl (Regional Director) and all Honourable LMC Members of the school visited the venue to bless the donors. Adequate supply of bananas, healthy foods and milk bottles were offered as refreshment to the Donors along with the certificate as a token of appreciation for their kind gesture. Total 175 units of blood were collected by volunteers who enthusiastically participated and came forward to manage the event and support society for their life saving gift of blood.